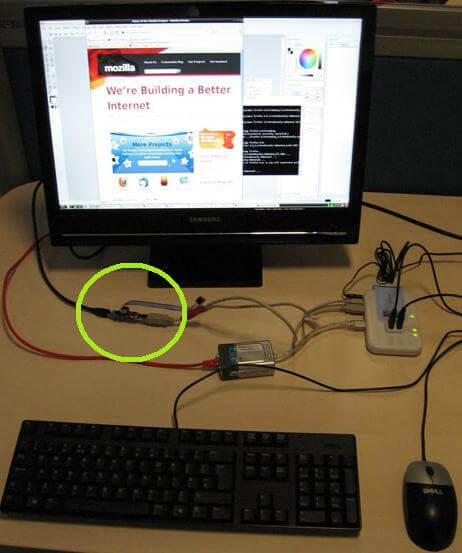 The Rasberry Pi PC prototype is the size of a flashdrive, but powerful enough to be useful to students. It’s called Rasberry Pi and the price for the new computer is as delicious as its name. Under development by The Raspberry Pi Foundation in the UK, the barebones PC is hoped to cost somewhere between £10 and £15, or roughly $15 to $25. An early prototype of the device is built on a flashdrive style PCB, so not only is Rasberry Pi cheap, it’s tiny too! Yet inside that tiny package is enough hardware for basic experimentation and development – there’s a 700 MHz ARM11 processor, 128 MB of RAM, and ports for HDMI, USB 2.0, and SD memory card. Check out David Braben, a famous British game developer and pillar of the foundation, describe the purpose behind Rasberry Pi in the video below. If they can actually mass manufacture this tiny PC for $25, it could become the platform that allows young people everywhere a chance to explore and innovate computing. As Braben points out in the video, many Information and Communications Technology (ICT) education in the UK focuses more on using computers than experimenting with them. The same is true in computerized nations around the world. In part that’s because you don’t want children to hack and tinker with expensive hardware. At $25, however, you could give a child a Rasberry Pi PC and let them have it. Hopefully their mucking around with it will be an educational experience. Ideally such open exploration would lead to a new generation of computer scientists and engineers who gain years of valuable experience before they ever reach university. This plan could work in computer rich countries like the UK, and it might help in developing parts of the world. Despite some successes in funding and organization, OLPC has faced the same problems that all cheap computers for children concepts have faced: it’s really frikkin’ difficult to make reasonably good PCs for so little money. Even when you strip out all the designer software and go open source (Rasberry Pi runs Ubuntu for example), even when you use lower speed processors and cheap fabrication techniques, even when you plan on using efficiency of scale and produce these things in the millions – you still end up with costs that are above the target. Or you run into other problems: like setup expenses are too high, or your prototypes don’t run very well, etc, etc. With such a history surrounding its concept, Rasberry Pi faces a pretty daunting uphill battle. Rasberry Pi requires users to provide their own TV, keyboard, memory card, etc. Here's the device in a proposed setup. That being said, it does have some things running in its favor. First, it’s really barebones. Students would have to use their own TVs (with HMDI), their own keyboards, and their own SD cards. That means there is less on the actual board for the Rasberry Pi Foundation to worry about. Second, related hardware costs (for the ARM11, RAM, PCB manufacturing, etc) are coming down. Lastly, Rasberry Pi seems custom made to be offered as a kit. Release the hardware specs for the PCB (or sell the boards), provide a nice construction FAQ online and maybe teachers and students around the world could hack Rasberry Pi PCs together on their own. Perhaps for as little as $25, maybe for something comparable and acceptable depending on loccation. I know that Arduino does a lot of good just by providing basic open source boards, I imagine the same could happen with Rasberry Pi as well if they went the kit route. Whether or not the Rasberry Pi Foundation manages to launch their PC by summer of 2012 (their tentative date apparently), you can bet that other organizations will continue to try to bring cheap computers to the masses. Computing is the foundation of the future economy, and if students can learn how to peak inside the field by experimenting with their own PCs they’ll have a strong advantage when they join that economy. Keep up the good work Braben. Let us know when the Rasberry Pi is ready to come out of the production oven.